Hanging in the Curfew Tower, the bell tower of St George’s Chapel, are a series of photographs of the bell ringers past and present. 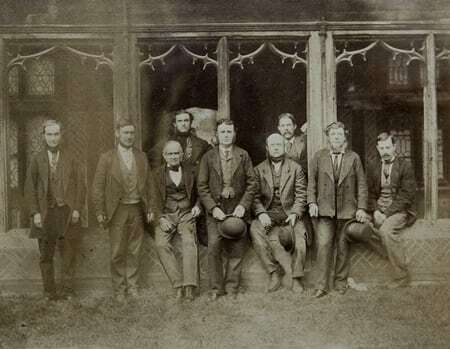 The oldest of these is this photograph, showing the bell ringers who worked for the chapel in August 1878. The bell ringers are listed from left to right as J. Newport, G. Gibbons, J. Holloway [seated], T. Clarke, H. Appleton, J. Beauchamp [seated], J. Holloway Jnr., A. Buttler and A. Fussell [seated]. John Holloway first appears at St George’s in the 1851 census as a labouring man, living with his wife Hester in the Curfew Tower. Also living there is William Davenport and his wife Elizabeth, as bell ringer and organ blower. By the time of the 1861 census, John and Hester have a son, John William, and Holloway is described as the College Gardener. The first record of his held in the archives is a bill for plants purchased, dated May 1862. His role as gardener was to have the care of the garden, weed the stable yard, have the care of the water tank and to act as turncock. He was paid £43 a year, and was given accommodation. In May 1874 he was given an additional 10s for his help in the Belfry when a chimney took fire. In February 1875, the Chapter Acts list a payment to widow Davenport, suggesting that sadly William had passed away. George Edwin Gower was appointed bell ringer and organ blower in his place, but in July 1875 he was given notice to leave. He seems to have been given a second chance, but on 12 June 1876, the decision was again made in Chapter to request his departure within 3 months. In October 1876, John Holloway is first paid as the Belfry Keeper. This was a promotion, giving him an extra £7 per annum and new responsibilities. As Belfry Keeper, John was responsible for tolling the bell for services, preventing ringing after 8pm and for rejoicing unless a specific order had been given, he had charge of the Belfry and crypt contents, he was to blow the organ at all services and rehearsals, keep the organ gallery clean and to open and close the gates to the Hundred Steps. Already in his 60s, he was to continue this role for the next 14 years. Sadly, Hester never lived to see her husband as Belfry Keeper, dying shortly before his appointment. In the 1881 census, John Holloway is listed with John William back living with his father and working as a general labourer, as well as being one of the bell ringers. In 1891, at the age of 81, John Holloway requested permission to leave his quarters in the Curfew Tower on account of his old age, a fixed payment of 40 guineas per annum was granted to him by Chapter, and Richard Coyde was appointed to do those duties that Holloway was unable to. The last payment made to John was in April 1892, and on 26 April 1892, Richard Coyde was appointed to be Belfry Tower Keeper “now that John Holloway is dead”. For nearly 50 years, John Holloway lived and worked at St George’s Chapel, with his son, as one of the Chapter Officers. This photograph is a splendid reminder of this long-standing member of staff.